When you compare a couple of Matchbox kits you'll notice that there are a few distinct types of packaging. This has largely evolved though the years. What may be a bit confusing to the novice collector is that these changes took place gradually. When new kits were introduced they were designed to the latest ideas that the marketing department had for their branding. However older kits were still available in former types of packaging and some never got updated at all. Changes in packaging also involved smaller or bigger changes in the boxart, but that's another story. 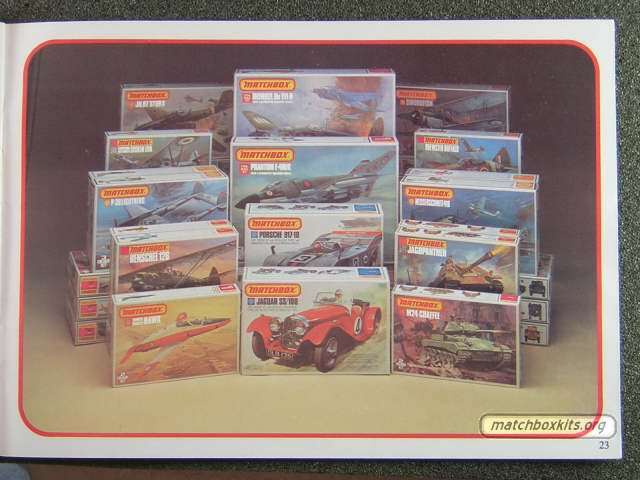 The first packaging of Matchbox kits was in a box that had a separate lid (pic # 2). This was introduced in 1972 and used for the first 20 kits in the Purple range. In 1973 the box was only slightly changed. It now opened though flaps on the side of the box and got a see though window at the back (pic # 3) so you could see the colours of the sprues. By 1975 the Matchbox logo was redesigned from a rectangle to a curved outline (pic # 4). This logo was used on a lot of new kits and the packaging stayed that way until 1979. Then another slight redesign was made, the name of the model was printed in black (pic # 5) instead of the white text that was used up to now. The sides of the kits also got a bit of a makeover. That was nothing compared to the complete redesign that was done for the 1982 releases. Although Lesney found themselves in hard times, the branding of the Matchbox kits completely changed. This design of packaging (pic # 6) was continued up to the end of the 80's despite of a series of takeovers that occurred. After that the Matchbox brand was leased to Revell for a ten year period. See the section on Revell-Matchbox and the Revell-Matchbox story for more details on this final period.